The Lodge - Orrsome Tassie Trout. Our lodge is situated on the shores of Brady's Lake with expansive #water and bush views available from every building. We are in the geographic centre of Tasmania some 2.5 hours drive from either Hobart or Launceston airports. The lodge opens for business on September lst and closes on April 30th but bookings for the following season are accepted throughout. 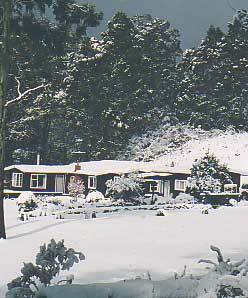 We are a fly fishing lodge but non-angler partners are welcome to come and rest, relax, regenerate and enjoy the Central Highlands of Tasmania and all it has to offer. The privacy of the cabins means you will not be disturbed unless you want to be and we can even serve a breakfast basket to your door to overcome angler breakfast times. We have phone, fax and email facilities at the lodge but the cabins are free of these intrusions. CDMA mobile phones do work at the lodge and in many of the surrounding areas but mobile phones are not welcome whilst out enjoying the wilderness and it's fishing. 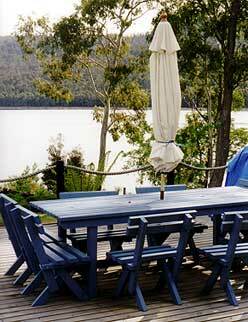 We can pick up from either airport and transfer to the lodge and return but prefer the better-paved drive from Hobart. This is a service we provide for many guests and of course is an additional cost but makes for an easy airport lodge transition. Our lodge and guiding operation is fully accredited by the Tourism Council of Tasmania, Transport Tasmania, The department of Tourism and Tasmanian Guides and Lodges. Our chef Marea presents many tasty. delights utilising seasonal Tasmanian produce and as such our guests get a real taste of Tasmania. Angler's breakfasts usually consist of a selection of cereals, fresh fruit, yoghurt, eggs and smoked grilled bacon, juice and coffee or tea. Lunches go out with the guides and anglers and often consist of home made breads and cakes. Dinner is a three course set menu and may include such dishes as a sweet corn and lemongrass soup with seared Tasmanian scallops, roasted rack of Tasmanian lamb with port and rosemary sauce followed by marinated fresh berries and homemade ice cream. As long as we know in advance we will cater to your specific dietary requirements. The meal at the end of the day is a great time to catch up with other anglers and guides and spin yarns and tell tales whilst enjoying some of the best of food and wine Tasmania has to offer.